After a hectic schedule at Anandpur Sahib , the Duchess of Cornwall had a bad day at the National Institute of Pharmaceutical Education and Research here today. First, her dress was left dripping and soiled while she was planting a sapling and then she fell down when she was about to sit to sign the visitor’s book. 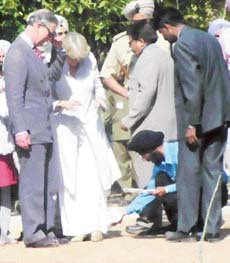 Even as Prince Charles, the future king of Britain, today concluded his much-publicised two-day trip across Punjab, the Union Ministry of External Affairs, had instructed the Chandigarh Administration that a full-scale formal welcome, as per protocol. There seems to be no escape for Prince Charles and Duchess of Cornwell from the bear. 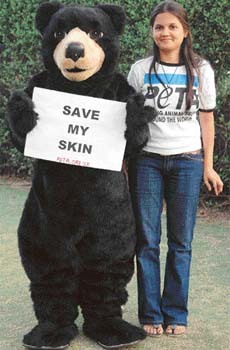 Though there were plenty of bear hugs for the Royal couple in Punjab a “bear” followed them passionately from all the way from London with a passionate appeal to “save my skin”. Unable to break free from the web of drugs, a 23-year-old addict ended his life by consuming some poisonous substance at his Dadu Majra Colony residence. His body was recovered from his rented accommodation late last night when his room mate came back to the city after three days. A 22-year-old student of Rayat College of Engineering and Technology was killed while three others were injured after their over speeding car rammed into an electricity pole near Jayanti Majri Naka late last night. The victim, Gagandeep Singh of Kapurthala, succumbed to his injuries on the way to hospital, said the police. With just three days left for an end to the monopoly of the liquor cartel which has been “dictating” the prices of liquor in the past and the current financial year, the cartel today adopted wait-and-catch policy in the run up to March 31. To meet the demand for power in Punjab and Haryana in the coming summer season, the Union Government will make a firm allocation of power to both states in two major hydro-power projects, in Bhutan and the Tehri Dam, says the Chairman of the Central Electricity Authority, Mr Rakesh Nath. Ignorance on part of a Chandigarh Traffic Police officer cost an NRI dear. He was challaned for “failure to produce a driving licence on demand”, just because the cop on duty could not recognise an international licence possessed by the NRI. With the Chandigarh Transport Undertaking (CTU authorities having stopped the special bus service between Bartana and Tribune Model School, Sector 29,residents of Bartana and the adjoining areas are a harassed lot. Municipal Corporation, Chandigarh has filed a special leave petition in the Supreme Court against the orders of the Punjab and Haryana High Court to take back possession of an SCO in pocket 6 of Manimajra. Employees of the Municipal Corporation and the UT Administration will observe a daylong strike tomorrow. This was stated by members of the co-ordination committee of the MC employees and workers of the UT, Chandigarh, at a press conference here yesterday. A meeting of the Regional Committee, Employees’ Provident Fund Organisation, Punjab region, was held at the Punjabi Mini-Secretariat here today. It was chaired by Mr M.P. Singh, Secretary, Labour and Employment, Punjab, and attended by the Labour Commissioner, other officers of the Punjab Government and representative of employers and employees. The Chandigarh Administration’s decision to introduce air-conditioned taxis in the tricity has raised a storm with the taxi unions opposing the decision tooth and nail. Urging the administration to hold the decision “in abeyance”, the Ekta Taxi Union, Railway Station, alleged that the decision would hit taxi operators hard. The Punjab Governor and Chandigarh Administrator, Gen (retd) S.F. Rodrigues, today asked the NABARD authorities to reorient their approach and utilise the bank’s resources to empower the common man and help improve quality of life, besides accelerating the process of national development through public-private partnerships. A major causality was averted today when a fire broke out at the Kalka railway station yard. The fire occurred at about 12 pm when a condemned narrow gauge coach caught fire at the yard. Farmers from Punjab, Haryana and Himachal Pradesh staged a protest against the UPA government at Matka Chowk here today. They were protesting the government’s decision to import wheat. The police resorted to lathi charge and use of water canons and threw tear gas at protesting activists of the Punjab Pharmacist Association at Matka Chowk here today. As many as 12 activists got injured in the action. Ashwani Gupta, son of a former Mayor of Chandigarh and treasurer of the Haryana BJP, Mr Gian Chand Gupta, died in an accident after his car collided with a truck in front of the ITBP camp at Bhanu today. In a major breakthrough, the Narcotic Control Bureau and Border Security Force following a joint operation claimed to have seized 19 kg of heroin, a Pakistani made pistol, two magazines and 16 live cartridges with the arrest of an Amritsar resident from Indo-Pak Border, late last night. Dr Avinash Jolly of Sector 20-D reported the theft of his Maruti Car (CH-01-T-1286) from Lajpat Rai Bhavan, Sector 15 on Monday. A case of theft has been registered. The Maruti 800 car of Sector 28 resident Parmal Kumar Gupta was stolen in his presence here yesterday. 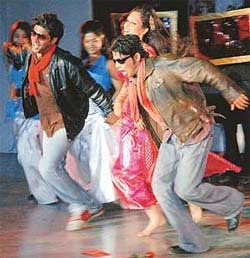 The incident took place at the Sector 22 parking opposite the Kiran Theatre. The Punjab School Education Board cleared a budget of about Rs 100 crore for the year 2006-07 at a special meeting held here today. The members proposed to contribute a sum of Rs 5 crore to the pension corpus fund so that pension could be paid to employees, including teachers of Adarsh schools. Over 200 students of DAV college ,Sector 10, here staged a protest against the college management and principal for withholding their roll numbers following shortage of their lectures. Palak Mehra of the KBDAV School, Sector 7, has topped in the DAV education board Class VIII examination in Chandigarh, Panchkula and Mohali by securing 92.67 per cent marks. Debashish Ghoshal has stood second by securing 91.50 per cent marks in the examination, results of which were announced yesterday. In response to the call given by the Punjab and Chandigarh College Teachers’ Union, the executive committee members of PCCTU staged a dharna at Matka Chowk, Chandigarh yesterday. The NIFD’s annual awards and cultural function was held at the Kala Gram here this evening. A local court today granted production warrant to the Chandigarh Police to bring BKI chief Paramjit Singh Behora from Delhi. The bail application of Bheora moved by his counsels was rejected by the court. Art stayed on to enrapture the audiences again today as art historian Dr Goswami took control of its aspects at Government Museum auditorium this afternoon. Mr Tilak R. Sarangal, Secretary, Health and Family Welfare, Punjab and Managing Director, Punjab Health Systems Corporation, inaugurated the second Professional Development Course in Management, Public Health and Health Sector Reforms for district-level Senior Medical Officers at the State Institute of Health and Family Welfare here yesterday. 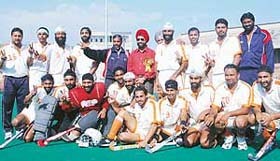 Punjab State Electricity Board defeated Calcutta Electricity Supply Corporation Limted 2-1 in the final of the 32nd All-India Electricity Boards Hockey Tournament at the Sector 42 Hockey Stadium here today. Amar Ujala lifted the Airtel-Press Club Inter-Media Cricket Trophy by beating Dainik Bhaskar by four runs in the final of the tournament at the Punjab Cricket Association stadium here today. Dainik Bhaskar elected to field first and Amar Ujala scored 167 for 5 in their allotted 30 overs. Winners of the Airtel-Press Club Inter-Media Cricket Tournament at the Punjab Cricket Association stadium in Mohali on Tuesday. The Chandigarh Wrestling Association today announced its 42-member team which will take part in the Senior and Junior National Wrestling Championships to be held at the Chaudhary Bharat Singh Memorial Sports School in Nidani (Jind District) from March 31 to April 3.